The Code of Conduct Tribunal (CCT) has adjourned to Tuesday, January 22, the proceedings in the non-declaration of assets charge against the Chief Justice of Nigeria (CJN), Walter Samuel Onnoghen. The adjournment came following the agreement of all parties that the charge and summons was not properly served on the CJN who did not appear at the tribunal. The Federal Government has employed the services of a former Commissioner of Justice in Kano State, Aliyu Umar, to head the team of prosecutors, while a leading Senior Advocate of Nigeria (SAN), Wole Olanipekun is the lead counsel to the defendant. Umar was also the prosecutor during the trial of Senate President, Bukola Saraki and his deputy, Ike Ekweremadu. The tribunal chairman had at exactly 10am when the charge marked CCT/ABJ/01/19, was called up, demanded to know why the CJN was not in court and if he was served with the charge. Responding, Umar, the prosecutor told the court that the CJN was served through one of his personal assistants. â€œWhen we went to his house, he directed his personal assistant to collect the charge on his behalf. His personal assistant endorsed it, so he has been servedâ€, Umar who led five other government lawyers, told the tribunal. However, Chief Wole Olanipekun, who led many Senior Advocates of Nigeria and other lawyers, told the tribunal that the CJN had filed a motion dated January 14, challenging the jurisdiction of the tribunal to try him. He said: â€œMy lord we are not just challenging the jurisdiction, we are even challenging the jurisdiction of this tribunal to even sniff that chargeâ€, Olanipekun submitted. Olanipekun further challenged the competence of service of the charge, insisting that under sections 123 and 124 of the Administration of Criminal Justice Act, ACJA, 2015, criminal charge ought to be personally served on a defendant. 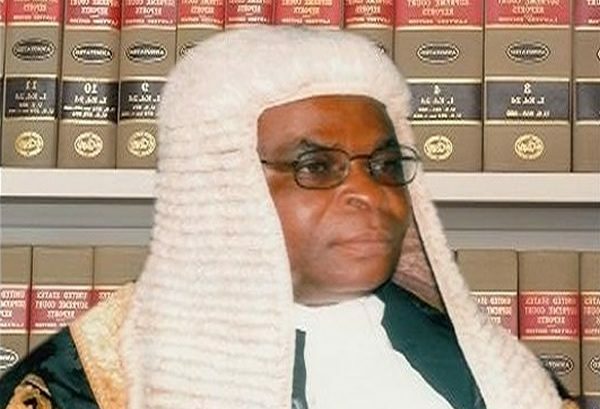 Meanwhile, after a clerk of the Tribunal, following a query from the Chairman, confirmed that the charge was received on behalf of the CJN, by one Sunday O. Osai who was identified as his personal assistant, the prosecution counsel, applied for FG to be allowed to effect another service of the charge on Justice Onnoghen. The prosecution,however, pleaded the court to direct that the charge should not be handed to another person aside the CJN. Following argument over legal technicalities for about an hour, the Chairman of the tribunal, Justice Danladi Umar directed that the six-count charge against the CJN should be served on CJN personally before adjourned date. He also directed that all the interlocutory applications would be heard on that day. Over Senior Advocates of Nigeria (SAN) sighted at the CCT as part of the defence team of the Chief Justice of Nigeria included: Wole Olanipekun, Adegboyega Awomolo, Kanu Agabi, Chris Uche, Yusuf Ali, Garba Tetengi, Effiong Offiong, Kehinde Ogunwumiji, Paul Erokoro, Tawo Tawo, Victoria Awomolo, Sebastine Hon and Chukwuma-machukwu Ume among others.